"An epic story of love." “Anna Karenina” is the latest retelling on the renowned Leo Tolstoy tale. The story is set against the backdrop of nineteenth century Russian aristocracy and the complex social workings that that world encompassed. The film still revolves Anna’s unaffectionate marriage to her elder, respected husband and her adulterous love affair with a young, dashing Russian cavalry officer, Count Vronsky. Dazzling cinematography recreates nineteenth century Russia for the viewer. There are beautiful physical settings, breathtaking palaces and exquisite clothing to show the privileged society in which the story occurs. Anna’s struggles to choose between her current life and the new loving relationship become the focus of the film as others around her begin to shun her away because of her devious behavior. She is greatly torn between the happiness that she has only felt with the young cavalry officer, a romance that would destroy her in Russian society, and her son, which has been the only way she has found any love at all during her cold marriage. Several smaller characters, such as Anna’s brother and sister-in-law, add pieces of their own story that helps fill in gaps in Anna’s thinking and why her internal conflict is so agonizing. Anna’s brother is also entangled in an affair, a situation which initially brings Anna to Moscow as a moderator. Constantine Levin, an acquaintance of Anna’s, develops a minor sub story with his courtship of Kitty, a woman that he experiences trouble in wooing due to her own feelings toward the Vronsky. Anna and Levin’s stories continue their battles to find what is best and right for themselves; Anna’s fate ultimately leading into a dark ending, isolated from her family and friends while Levin finally finds the happiness he’s been searching for his entire life. 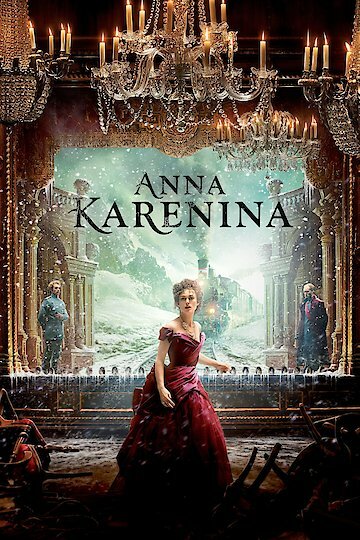 Anna Karenina is currently available to watch and stream, download, buy on demand at Amazon Prime, Hulu, Starz, Vudu, Google Play, FandangoNow, iTunes, YouTube VOD online.